According to reports from Channel News Asia, the Singapore Ministry of Health is bolstering mental health services, beginning in 2017 and going forward for the next five years. The five-year master plan, which will launch later this year, was announced in Finance Minister Heng Swee Keat’s budget speech. Amy Khor, the Minister of State for Health, also explained the plan during the Committee of Supply debate on Thursday, March 9th. As part of the five-year plan, the Agency for Integrated Care is taking on the role of “first responder.” When there is a definitive mental health need in a community, representatives from the agency are empowered to respond and act. They will also coordinate social services with health care. In addition, many of the staff at the Housing and Development Board, the Singapore Police Force, and the National Environment Agency will go through special training. They will learn how to identify people with possible mental health needs, and they will be taught how to react and respond in various situations. Elderly citizens of Singapore have mental health needs specific to people nearing the end of life. To answer this need, more mental health and dementia services are planned within Singapore polyclinics. As part of the new plan, the Health Ministry also intends to improve end-of-life care. An agency known as Advanced Care Planning is being expanded, with branches in multiple care settings. This agency helps medical teams and loved ones arrange palliative care for dying patients. The Ministry also plans to improve areas like grief counselling and bereavement support for caregivers and families. Another significant need for mental health patients in Singapore is after-care. After patients have recovered enough to leave the Institute of Mental Health (IMH), they need plenty of support and ongoing care to ensure that they don’t slip back into a crisis situation. 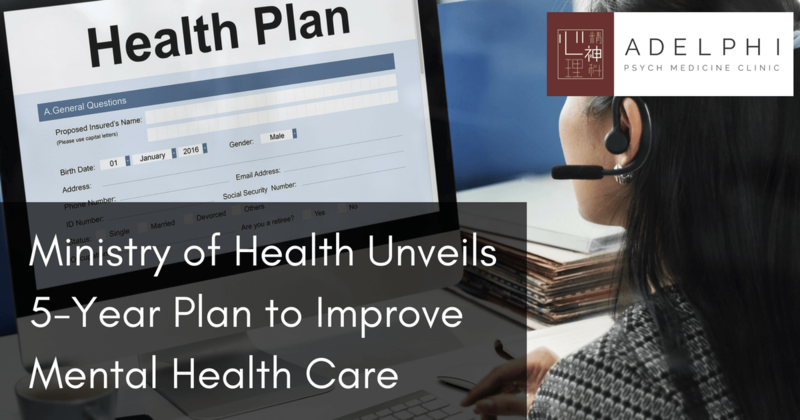 Thanks to the new plan, the IMH should be able to extend after-care to an additional 3,000 patients during the next five years, while continuing after-care services for the current 8,000 patients. The after-care services are essential to help patients transition back into regular life. Patients have to adjust to being back home, and they need support for case management workers as they face old triggers or new stresses in their lives. With the right after-care, these individuals care can move successfully into their social circles and become active, healthy citizens again. Greater awareness for mental health in Singapore, as well as improvements in care and accessibility, are good news to the team at Adelphi Psych Medicine Clinic. We encounter many people with mental health needs in Singapore, and our staff of Singapore psychiatrists is constantly working to improve services and treatments for these afflicted patients. If you or a loved one are suffering from poor mental health, come to our clinic to experience a warm welcome and a confidential consultation that will put you on the path to recovery. Source: Channel News Asia, March 9, 2017.